Periodontal disease is a common dental disorder that most people are unaware that they have. When patients are first diagnosed with it, they often ask Dr. Qureshi at Healthy Smiles of La Grange “What causes periodontal disease?” This disease often starts with plaque, a sticky substance composed mainly of bacteria. Although brushing and flossing helps to remove plaque, it can be hard to keep it off your teeth. That is because plaque re-forms within 24 hours of you removing it. One way to reduce the risk of developing plaque is to avoid foods with a high sugar content. When your teeth get heavily coated with plaque, it eventually causes tartar. This is a hard substance that can be difficult to remove from the teeth with normal brushing and flossing. Eventually, plaque and tartar eat away at your gums and teeth and cause gum pockets to form. This becomes a vicious cycle because gum pockets attract even more plaque, tartar, and bacteria. When you don’t get treatment for periodontal disease, it can threaten the health and stability of your teeth. You may even lose one or more teeth to the disease. 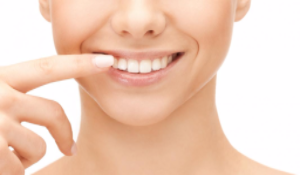 Once periodontal disease has developed, it’s important to treat it as quickly as possible. Dr. Qureshi may advise you to undergo root planing and scaling, a process also known as deep cleaning. This removes bacteria and decreases the size of gum pockets. You normally come to Smiles of La Grange for at least two separate deep cleaning appointments. Afterwards, it’s important to eliminate the risk factors you can control and commit to brushing and flossing your teeth at least twice daily. Dr. Qureshi only recommends dental surgery to remove gum pockets when deep cleaning and home care fails to bring lasting relief of periodontal disease. If you’re concerned about the possibility of periodontal disease, please contact our clinic at any time. You don’t have to wait until your next scheduled exam to ask questions or request additional cleaning by our staff.